a work in progress: Lola and Hershey! Sometimes I wonder about these two. They have this Love-Hate relationship thing going on. Hershey has all these hiding places all over our house.. under beds.. under the ottoman .. under covers .. pretty much any place Lola can't get to her. 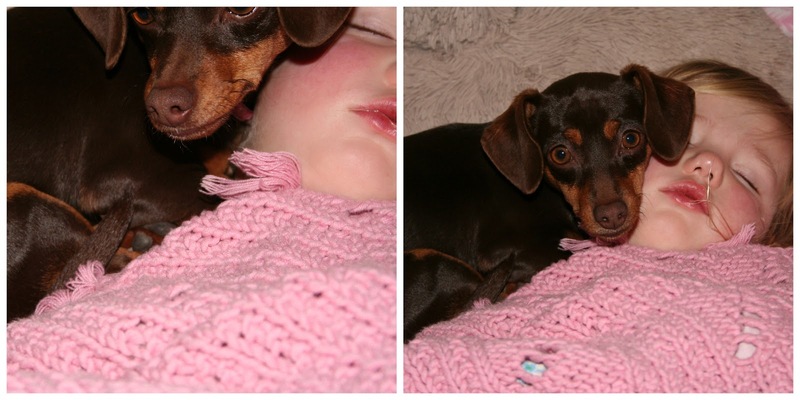 Lola LOVES her Hersh! And I am pretty sure that Hersh loves her back. I found Hershey practically on top of her the other night when I was peeking in on the children. It is beyond me that Lola can sleep through this. One thing I know for sure Lola would be a lonely girl with out her Hershey. !Best Friends! That is soooo dang cute! Love her!